Pandas, it turns out, aren't celebrating the Year of the Horse. Livestock, particularly horses, have been identified as a significant threat to panda survival. The reason: They're beating the pandas to the bamboo buffet. A paper by Michigan State University panda habitat experts published in this week's Journal for Nature Conservation explores an oft-hidden yet significant conflict in conservation. "Across the world, people are struggling to survive in the same areas as endangered animals, and often trouble surfaces in areas we aren't anticipating," said Jianguo "Jack" Liu, Rachel Carson Chair in Sustainability at Michigan State University (MSU). "Creating and maintaining successful conservation policy means constantly looking for breakdowns in the system. In this case, something as innocuous as a horse can be a big problem." China invests billions to protect giant panda habitat and preserve the 1,600 remaining endangered wildlife icons living there. For years, timber harvesting has been the panda's biggest threat. 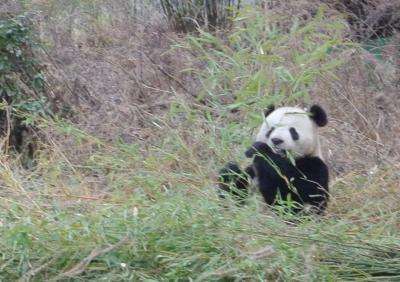 Pandas have specific habitat needs – they eat only bamboo and stay in areas with gentle slopes that are far from humans. Conservation programs that limit timber harvesting have chalked up wins in preserving such habitat. Vanessa Hull, a doctoral student in MSU's Center for Systems Integration and Sustainability (CSIS), has been living off and on for seven years in the Wolong Nature Reserve, most recently tracking pandas she's equipped with GPS collars. She has been working to better understand how these elusive and isolated animals move about and use natural resources. 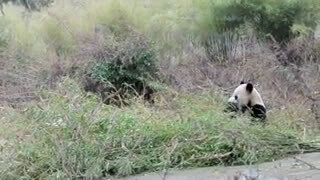 Over the years, she started noticing it wasn't just pandas chowing on bamboo. "It didn't take particular panda expertise to know that something was amiss when we'd come upon horse-affected bamboo patches. They were in the middle of nowhere and it looked like someone had been in there with a lawn mower," Hull said. Alarmed by the growing devastation, she learned that some of Wolong's farmers, who traditionally hadn't kept horses, had been talking to friends outside of the reserve who had been cashing in by raising them. A horse there, Hull said, is kind of a bank account. Horses were barred from designated grazing areas because they competed with cattle, so farmers would let them graze unattended in the forests. When funds were needed, they would track the animals down and sell them. This horse problem has been resolved. The researchers presented their findings to Wolong's managers, who have since banned horses from the reserve. But Hull and Liu note that this work has shed light on how competitive livestock can be in sensitive habitat – an issue that is repeated across the globe. "Livestock affect most of the world's biodiversity hotspots," Liu said. "They make up 20 percent of all of the earth's land mammals and therefore monopolize key resources needed to maintain the earth's fragile ecosystems."